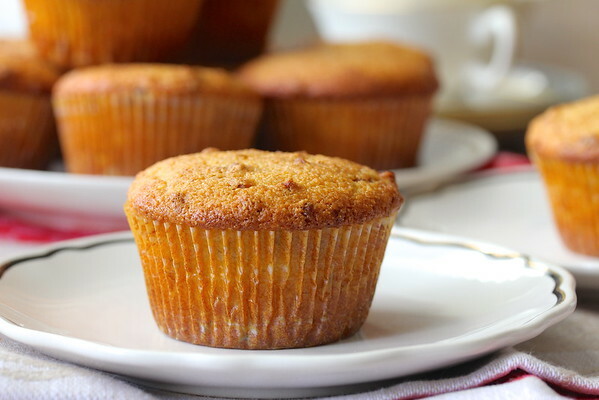 These cornbread bacon muffins combine the sweet and savory flavors of the bacon, corn bread, and the secret ingredient, maple syrup. The thick cut bacon is julienned and then cooked to a golden color. Next, the bacon is cooked in maple syrup. The muffins also contain toasted pecans and brown sugar. 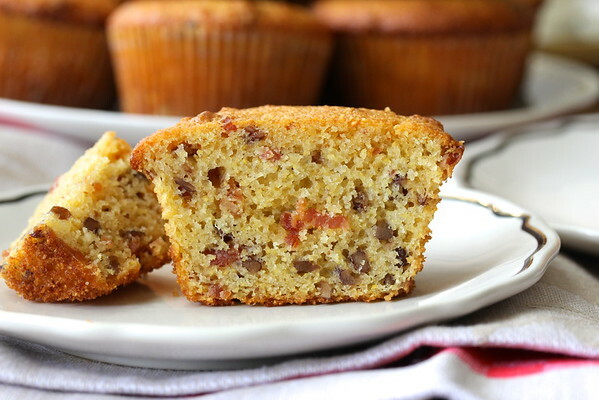 The secret savory ingredient in these muffins is the rendered bacon fat. Yep! It infuses these muffins full of bacony flavor. If you're going to eat bacon, you might as well go all in! They smell amazing when they are baking. When I was growing up, my parents kept a can full of rendered bacon fat, which they used for frying. It was especially good when used for frying eggs. I like to keep some in the freezer, and it is amazingly delicious for making popcorn. 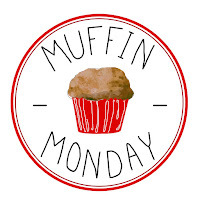 After the recipe, be sure to browse all of the amazing muffin recipes from the #MuffinMonday bakers. Makes 12 muffins. Adapted from The Dahlia Bakery Cookbook by Tom Douglas. It's pretty amazing. Preheat the oven to 375 degrees F and line a muffin pan with liners. Fry the bacon pieces over low heat until golden and the fat has rendered off. Using a slotted spoon or spider strainer, drain the bacon on a paper towel lined plate. Let the rendered fat cool. In a nonstick pan, mix the cooked bacon with two tablespoons of maple syrup, and heat over medium low. Cook for about 4 to 5 minutes, until the maple syrup has reduced and coats the bacon. Turn off the heat and let cool. Once the maple bacon has cooled, use a mandoline or chef's knife to cut it into chips. in a medium bowl, whisk together the eggs, oil, sour cream, milk, the rest of the maple syrup, and bacon fat. Add the bacon chips. In a large bowl, sift together the flour, brown sugar, and baking powder. Add the cornmeal, pecans, and salt. Add the liquid ingredients to the dry ingredients and fold together until combined. Scoop the batter evenly into the muffin cups. Each cup should require a heaping quarter cup of batter. I use this scooper. Bake in the center of your oven for 22 to 24 minutes, until a toothpick comes out with crumbs. Turn the pan halfway through baking. OH my goodness Karen, I was sold at cornbread and bacon and then you put it over the top with maple syrup. 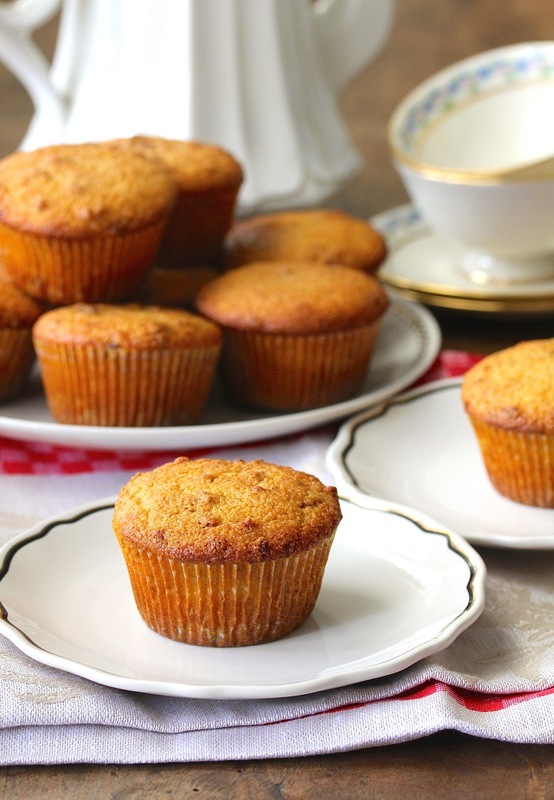 What a great muffin to hand to your loved ones as they run out the door to school or work. I knew I was going to like this muffin just from the name, Karen! I always have a jar of bacon fat in my refrigerator because it adds such a lot of flavor to everything. I'm pinning these to make soon! I'm so glad I'm in good company on this, ha ha! I have an artisanal container for bacon grease in my fridge! [It's a Kroger Southern Potato Salad tub which was empty and available the first time I saw my mother-in-law about to pour bacon grease in the trash after cooking a pound of bacon for our breakfast. I am a bacon grease fan, and was delighted to salvage the bounty. I am sure she thought, and still thinks, I am strange. I keep the container around for the memory, though I rarely have enough bacon grease to use in baked goods because I'm always frying eggs in it for my spouse. He's about to ship out, though, to the land of powdered egg product (which is why I've been frying him eggs a whole bunch) so my bacon grease supplies will soon grow. And then I'll try this--because I think the flavor would be divine. Awww, thanks Kirsten! I love your artisanal container =) I totally understand why you'd be frying a lot of eggs right now. I have an old pimento cheese container full of bacon grease for gravy making and I believe I need to make your muffins real soon - they will be a hit in this house! Ooh! I've never tried it in gravy! Sounds divine!!! Thank you! Bacon cooked in maple syrup? I'm definitely trying that.